A finely engraved topographical plan of 19th century Rome showing the monuments. Pianta Topografica della Citta di Roma dell'Anno 1836. 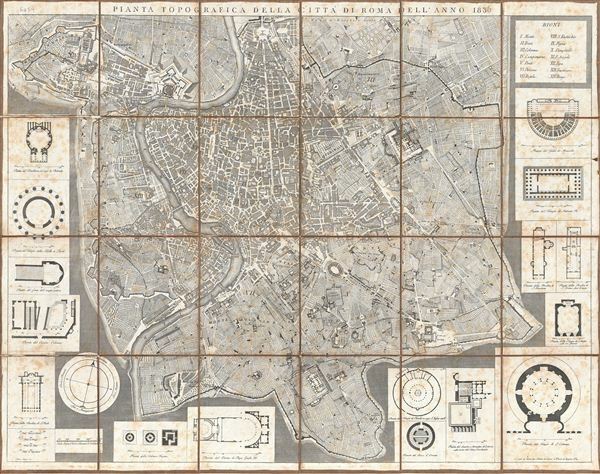 This is a fine 1836 topographical map or plan of Rome, Italy drawn by Pietro Ruga. Covers the walled center of Rome in incredible detail, reveling individual streets, buildings, parks, piazzas, temples, ancient ruins, and ecclesiastical centers. The map proper is surrounded by architectural illustrations of many of Roma's most important buildings, including the Teatro de Macello, the Tempio de Antonino Pio, the Templo di St. Constanza, the Pantheon, and many others. Prepared for the tourist trade, this map was dissected and mounted on linen in 20 panels. Pietro Ruga (fl. c. 1799 - 1830) was an Italian engraver and printmaker active in Rome during the late 18th and early 19th centuries. Ruga is best known for his architectural views of Italian, in particular Roman, monuments, furnishings, and antiquities. He is known for only two maps, both tourist pocket plans of Rome, dating to the 1820s. Good condition. Some verso reinforcement to original linen backing. Dissected and mounted on linen in 20 sections. Foxing throughout.